While debate has raged in Australia about the value of the AFL’s new 7-a-side format, AFL Asia’s Clubs have been quick to recognise the opportunities AFLX brings to the sport’s development abroad, announcing plans for the first AFLX tournaments to be held outside of Australia. In a big show of support for the new AFLX concept, two AFLX tournaments will be held in Asia in May. 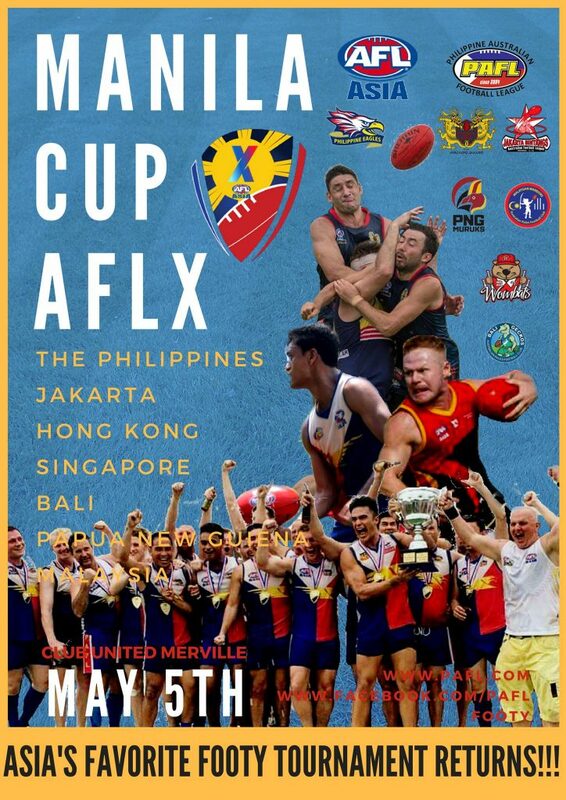 After a year’s hiatus, a revamped Manila Cup is back as an AFLX tournament featuring some of the best Clubs in Asia on rectangle pitches on Saturday 5th May. Then on Sunday May 20th the AFL Asia Shanghai Cup AFLX tournament will take over “Adelaide Arena” – Jiangwan Stadium as part of SHANGHAI 2018. Further AFLX tournaments are also being rumored for Hong Kong, Singapore and Bali this year. Asia is no stranger to scaling down the game to fit on the smaller fields used by Asia’s Clubs, with leagues such as the Hong Kong Dragon’s South China AFL and the Guangzhou Scorpion’s Guangdong AFL seeing China’s first generation of footballers learning the game on rectangle synthetic pitches for the best part of the past decade. The Philippine Australian Football League (PAFL) is excited to announce the world’s first AFLX tournament to take place outside of Australia. The tournament will be held in Manila on the 5th of May as part of the much-anticipated revamped Manila Cup. After a one-year hiatus the Manila Cup will return bigger and better than ever with a brand new format and new entry requirements. 2018 will see teams multiple teams from Hong Kong, Singapore, Malaysia, Indonesia (Jakarta and Bali), Papua New Guinea, and of course the Philippines compete for the coveted Manila Cup. This year will also see the first ever entirely indigenous Filipino team represent the Philippines in an international event. A truly exciting prospect and further evidence that footy in Asia is really growing. The Manila Cup has not only always been one of, if not the, most competitive tours on the AFL Asia calendar and it has also been one of the greatest social events of the year. 2018 will be even better than all previous years with the PAFL upping the standard in hospitality and entertainment. The aim is to turn the Manila Cup into the best footy competition outside of the Asian Champs. Ever since the PAFL’s inception in 2004 the club has always tried to be ahead of the curve and innovative in the tournaments, its season structure and its approach to building the game in Asia. The PAFL sees AFLX as having a strong place in Asian footy in the future and hopes to use the new format to generate even more excitement about our great game. 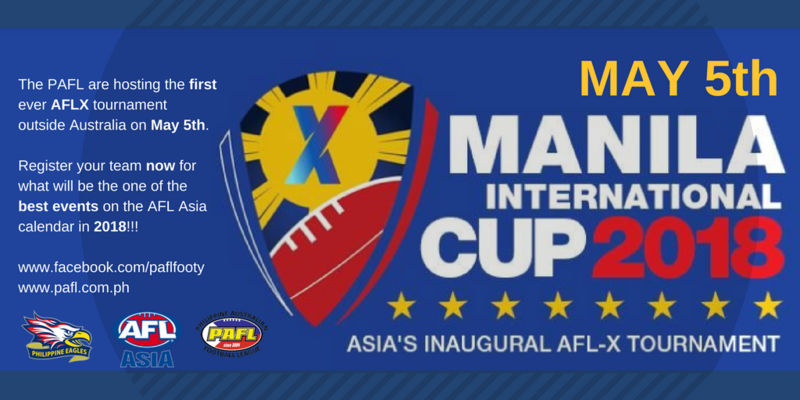 A modified AFLX format was selected for the Manila Cup as it truly suits the style of football played in Asia as well as the types of grounds many clubs in Asia play on. Nearly ever club in Asia has difficulties securing grounds and finding venues larger enough to field teams with significant numbers that also allow free-flowing, fast and skillful play. AFLX will give many Asian clubs the opportunity to not only play their natural style of footy, but also to host tournaments on home ground. Following the success of the inaugural 2017 Shanghai Cup played alongside the historic first ever AFL game for premiership points, AFL Asia and the Shanghai Tigers are pleased to launch registrations for this year’s Shanghai Cup. Thanks to the support of the AFL, this year we are very fortunate to be able to utilise the magnificent facilities and surface of Shanghai’s historic Jiangwan Stadium – which will be renamed Adelaide Arena for this massive weekend of football in Shanghai. The tournament will be run along AFLX rules (7-a-side), played across two fields from around 9.30am to 3pm. We are now seeking nominations for Open and Masters 35+ divisions (a final decision on a separate Masters Division will be made following the closing date). The weekend will also see the return clash of the Team China vs AFL Asia Lions “Curtain Closer”, played directly following the Port vs Gold Coast AFL Clash on Saturday 19th, with tickets available for all participating Shanghai Cup teams. The 2018 Manila Cup and Shanghai Cups are shaping up to be huge weekends and real turning points for footy in Asia.